Familiarize yourself with Earth’s atmosphere to prepare for the GED Science test. Earth’s atmosphere is composed of gases surrounding the planet and retained by Earth’s gravity. Although the composition of gases in Earth’s atmosphere is subject to change, the current mix is about 78 percent nitrogen, 21 percent oxygen, 0.9 percent argon, 0.03 percent carbon dioxide, 0.0 to 0.4 percent water vapor, and trace amounts of other gases. In addition to providing the oxygen that humans and other animals breathe and the carbon dioxide that plants require for photosynthesis, the atmosphere protects plants and animals by screening out a considerable amount of ultraviolet radiation, retaining heat from the sun, reducing temperature extremes, and facilitating the transportation of water via clouds. Troposphere: This is where you live and breathe. The troposphere begins at the Earth’s surface and extends up to the stratosphere. It contains roughly 80 percent of the mass of the entire atmosphere and is where most familiar weather patterns form. Stratosphere: The stratosphere is best known for the company it keeps. This is where the ozone layer hangs out. The ozone layer is comprised of triatomic oxygen (O3), meaning each molecule consists of three oxygen atoms instead of the standard two in the normal diatomic oxygen (O2) that you breathe. The ozone layer is great for blocking ultraviolet radiation from space, but this form of oxygen is toxic closer to the Earth’s surface as it is harmful to breathe and can burn plants. In the stratosphere, temperature increases the higher you fly. 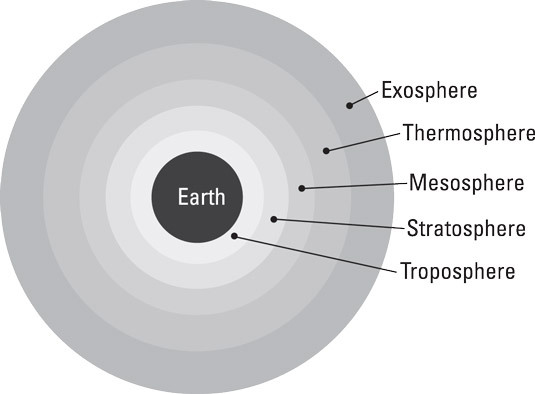 Mesosphere: This extends up from the stratosphere, and the temperature decreases as altitude increases. Most meteors burn up in the mesosphere before they have a chance to crash into the Earth because the density of the atmosphere rises considerably closer to the Earth’s surface. Thermosphere: This layer is toasty — up to 1200°C. It has a higher temperature at higher altitudes, but due to the lower pressure and the fact that molecules are so far apart, the “air” doesn’t feel as hot as it would at lower altitudes. Exosphere: This far-out layer contains mostly hydrogen and helium atoms. Cold front: Cold fronts occur where colder, denser air pushes under warmer, thinner air. Cold fronts travel faster than warm fronts and usually form more violent storm conditions and higher amounts of precipitation. Warm front: Warm fronts occur where warmer air forms a wedge over the colder air and slowly advances, pushing the cold air out. Warm fronts sometimes have thunderstorms on their leading edge, but more often form fog. Stationary front: When fronts stop moving, they’re said to be stationary, and you experience little if any change in the weather until another front pushes it out of the way. Occluded front: Occluded fronts form when cooler or warmer air is behind the front. When cooler air is behind the front, the cooler air moves under the cool air ahead of it, and the occluded front behaves very similar to a cold front. When warmer air is behind the front, the warmer air rises above the air that’s in front of it, and the occluded front acts very much like a warm front. In both cases, the boundaries between the warmer and cooler air are well-defined. Hurricanes, tornadoes, and other violent storms usually form when a cold air mass is above a warm water or land mass. This causes violently convective (air-moving) conditions that lead to violent storms. A front or a consistent wind generally triggers the spinning effects, but the true nature of how these storms are formed is still somewhat of a mystery. You can tell a lot about the weather by examining cloud formations. The following list explains the differences among the three types of cloud formations. Cirriform: Cirrus clouds are generally detached and wispy. They fly high and are generally non-convective, meaning they form when air movement due to temperature differences at different altitudes is minimal. Because of this, cirrus clouds are a sign of less turbulent weather conditions. Cumuliform: Cumulus clouds are mostly detached and fluffy. They are a product of local convective lift and indicate a more turbulent condition in the atmosphere. Stratiform: Stratus clouds are for the most part continuous and may have somewhat rippled form. These clouds usually form on slow-moving fronts with high levels of convective lift and float a bit lower in the sky than their cumulus cousins. The convection is across a much larger area than the conditions that form cumulus clouds and indicates turbulent atmospheric conditions. Which of the following presents the layers of Earth’s atmosphere in the correct order from the ground up? The ozone layer, which is located in the stratosphere, provides which of the following? Which of the following conditions is most likely to cause a violent storm? (A) A colder, heavier air mass pushes under a warmer, lighter air mass. (B) A cold front meets a warm front. (C) An occluded front meets a warm front. (D) A mass of cold air moves in above a mass of warm, humid air. Which atmospheric layer has the highest concentration of gases?